A bizarre illness has been recently identified in an isolated village in the Pacific Islands. Initial reports claim that the disease is most likely transmitted by a newly discovered species of mosquito. The reports have encountered much skepticism within the scientific community as they also suggest that newly born males of this particular mosquito species are often killed by a bacterial infection and the population is over 90% female. While the illness is currently confined to the small village, the Centers for Disease Control and Prevention (CDC) has been consulted for fear that it could easily spread to the mainland and cause a major pandemic. The newly discovered species in this case study appears to be closely related to this blood-engorged female Aedes albopictus mosquito feeding on a human host. Under experimental conditions the Aedes albopictus mosquito, also known as the Asian Tiger Mosquito, has been found to be a vector of West Nile Virus. 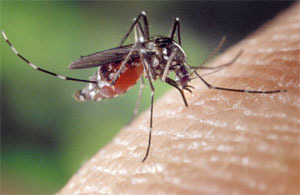 Image courtesy of CDC under Public Domain. You have been appointed to serve on a specialized task force which will explore the validity of the reports as well as provide recommendations for moving forward. The team will be led by a reproductive specialist, virologist, and epidemiologist. Using your expertise in these areas, you will deliver a comprehensive report to the Director of the CDC. Is it possible to have a bacterial infection that selectively kills males? If so, explain the biology. How has this strange biology propagated throughout the species? The illness does not respond to any known treatments. As biologists, how might you stop the spread of this disease?